Battle of Zab (750) - The Battle of the Zab (the Zab being a river in modern-day Iraq which runs into the Tigris) was fought in 750 and saw the overthrow of the Umayyad Caliphate and the rise of the Abbasid. Unrest began in 747 from the outlying regions of the caliphate. It had grown so large, the empire's provinces had to be administered by governors, most of whom were corrupt. Additionally, the Umayyad Caliphs could not claim descent from Muhammad, and many considered them illegitimate. In 750, an opposition army rose and prepared to march on the capital of Damascus. The Umayyad army met it at the Zab and they fought. Although it was larger, soldiers of the Umayyad army lacked a sense of loyalty to the caliph and did not fight an inspired battle. The opposition army formed a spear wall and repelled a lukewarm attack. 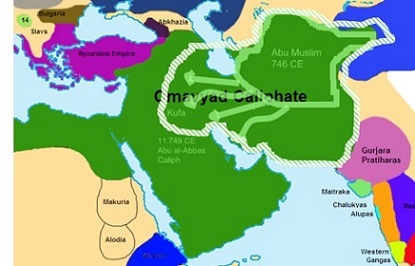 The Umayyad Caliphate was overthrown and replaced by the Abbasid. Its first caliph was as-Saffah, who was the great-grandson of Muhammad's uncle, 'Abbas. The caliphate took its name from Abbas and lasted until the 13th century, the longest standing of the the four Medieval caliphates. Umayyad caliphate was not completely destroyed, however. The Caliphate of Córdoba in Spain had been established by the Umayyads and was beyond the reach of the Abbasid.